...Cummins & Agriculture Solar-Diesel Hybrid Generators Increases Efficiency, Lowers Cost of Gas and Maintenance. Cummins and Agriculture Solar hybrid generator sets available in a range of sizes to meet any application. Able to start and assume load in less than 10 seconds, and rated load in a single step, Cummins and Agriculture Solar generators are the epitome of rugged dependability and reliable mechanical and electrical performance. Our generators are well suited to power management at large commercial or industrial sites. Cummins Power Generation has fully redesigned it high-range hybrid generator sets to deliver the reliability, efficiency and versatility that you want. The Cummins Power Generation and Agriculture Solar integrated models help you to gain control and stay ahead gaining control of your operations. This depends on a seamless integration of power system technology. As the only single-source manufacturer of engines, alternators, digital controls, transfer switches and digital paralleling systems, Cummins Power gives you not only superior power, but superior control, usability and local utility paralleling — all backed by one of the largest sales, service and support organizations in the world. Whether you need continuous, prime, peaking or standby power, cogeneration or a complete turnkey power plant — Cummins and Agriculture Solar are ready to match our transfer and control technologies with your power needs. 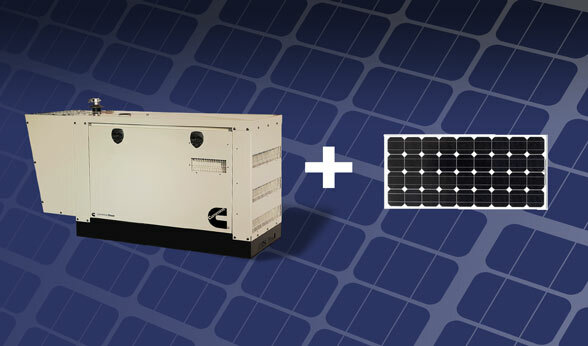 At Agriculture Solar, Cummins Hybrid Generators and Agriculture Energies can be your simple solution. Cummins and Agriculture Solar's hybrid commercial generator sets available in a range of sizes to meet any application. These clean, modern generator with optional exhaust aftertreatment are suitable for either standby/emergency power, continuous or prime power applications. Agriculture Energies systems have been successfully active in the top irrigation fields for over 10 years and continues to bring the tried and true principles and advantages of solar hybrid power. Think about it, and then make your move. Let Cummins and Agriculture Solar power management provide you with decades of reliability and lasting value. We invite you to explore the possibilities of our reliable hybrid power solutions.